The enclosures of terminal boxes are made of glass libre reinforced polyester. All the metal elements are anti-corrosive. Concave-convex joints between the covers and bodies are designed to mount an air-foam silicone bar, which secure a degree of protection IP65. Terminal boxes are used for dividing and connecting wires for various electrical apparatus and instruments in the circuits. Installation is certified for zones 1, 2, 21 and 22. Cables are made with Atex cable glands, either in polyamide, brass or stainless steel for corrosive areas. Zones 1, 2, 21 and 22. Customized custom and flexible configurations. 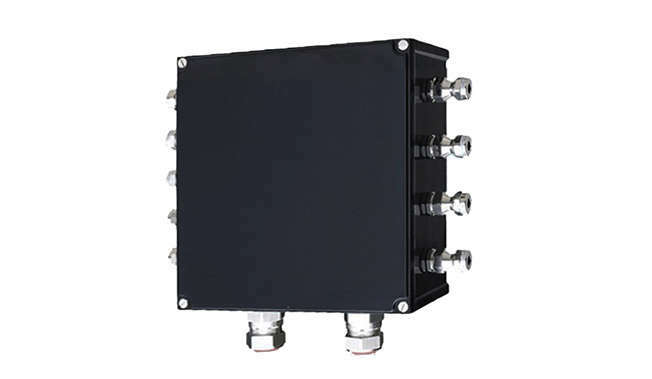 The enclosures of terminal boxes black are made of glass fiber reinforced polyester. lnternational certification IECEx, Atex, TUV.